Hey there! Thanks for dropping by Greg's ESS Blog! Take a look around and grab the RSS feed to stay updated. See you around! Knee-deep water inundated communities in south-east Australia today, splitting one town in two, as swollen rivers carried flood fears downstream and officials urged residents to evacuate. The state of Victoria is the latest area of Australia afflicted to be hit in the weeks-long flooding crisis that has left 30 people dead, caused once a century floods in many areas and could become the country’s costliest natural disaster. Horsham, in Victoria state, resembled a lake after the Wimmera river overflowed its banks and bisected the community before starting to recede several hours later. About 500 homes in the city, which has a population of 14,000, were surrounded by water. Across north-central Victoria state, more than 3,500 people have left their homes, with 51 towns and 1,500 properties affected by the rising waters. In north-west Victoria, floodwater has left 1,000 households without power, and thousands more homes face the threat of cuts as substations and low-lying power lines are submerged. The Australian prime minister, Julia Gillard, announced the formation of a business task force to assist with rebuilding devastated infrastructure in Queensland. A day earlier, she said the floods that ravaged Queensland could be the country’s most expensive natural disaster. 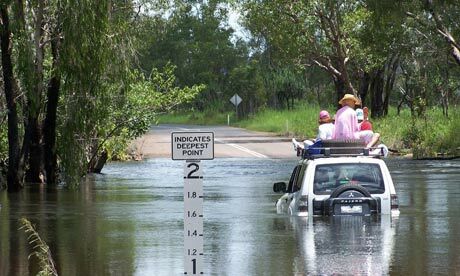 Most of the 30 people who died in Queensland were killed a flash flood that hit towns west of the state capital, Brisbane. The state’s flooding affected 30,000 homes and businesses, and left 12 people missing. The price tag from the floods was approximately 5 billion dollars before waters swamped Brisbane last week. I’ve already brought this up before, talking about my opinion and those of others. However, I feel I need to bring it up once more as the Guardian had another article on it. I am of course talking about the BP oil disaster. The presidential commission investigating the Gulf of Mexico oil disaster ran into controversy today by saying it had found no evidence that BP and other oil companies put profits ahead of safety on the Deepwater Horizon rig. In a preliminary finding by what is the first independent panel, the commission’s chief investigator found a series of missed warning signs before the April 20 explosion on the rig. Fred Bartlit, appointed by President Obama to investigate into the spill, complained repeatedly during his presentation that he did not have subpoena powers and had to rely on the goodwill of oil firm.”I wish I had that power because I think it’s damned important — but that’s the way it goes,” he said. The Senate refused to grant such powers. In a long and detailed re-enactment of events leading up to the explosion, Bartlit and his team outlined a clear trail where disaster could have been averted. The team also questioned executives from BP, Transocean and Halliburton. The investigation produced 13 findings on the path to the disaster. Eleven men died when the rig exploded, releasing nearly 5m barrels of oil and gas into the Gulf of Mexico. The Macondo well was from the start a challenging one. BP had intended to drill even deeper but stopped at 18,36 ft because of the difficulties of preventing oil seeping into the surrounding rock. • The cement seal at the bottom of the well failed to hold back oil and gas in the reservoir, and should have been redesigned. • BP and Transocean interpreted the failed negative pressure test as a success. • BP introduced additional safety risks in its plan to shut down the drilling rig. • Crews on the rig and in offshore offices should have picked up warnings on monitors that gas was rising from the well. • Rapid response at that time could have prevented a blowout. Many conclusions mirror those of BP’s internal investigation, and Bartlit said he agreed with 90% of it. The most significant conclusions for BP could be the finding that the leak rose through the drill pipe rather than the space between the casing and the rock formation. That supports BP’s contention that its well design was not a contributing factor in the explosion. ‘British Petroleum’s bill for containing and cleaning up the oil spill has reached almost $10bn (£6.4bn), as the US government declared that the blown-out well has finally been plugged, five months after the explosion on the Deepwater Horizon rig. BP also said payouts to people affected by the spill such as fishermen, hoteliers and retailers had dramatically increased since it handed over authority for dispensing funds to a White House appointee. 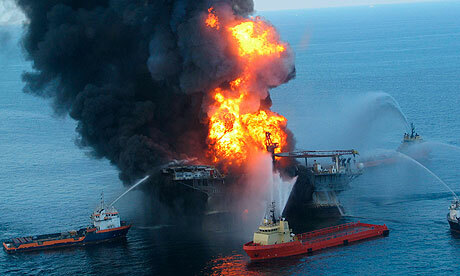 BP has set up a $20bn compensation fund, which has so far paid out 19,000 claims totalling more than $240m. What great official news! British Petroleum, the government and all other officials agree that the well is finally done spilling- for good. BP’s cleanup costs are huge though, and there are definitely going to be many fair trials. The legal costs are going to be higher because of BP’s huge negligence to the environment and everything. But realize, just for a second, what a huge number 10 billion dollars is, and the fact that there will be much, much more in fines to the oil giant over the next decade. That’s how long it takes for legal proceedings to do with environmental disasters to get completed.